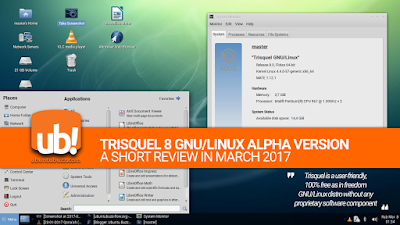 This is a short overview to Trisquel 8 Alpha Version operating system. 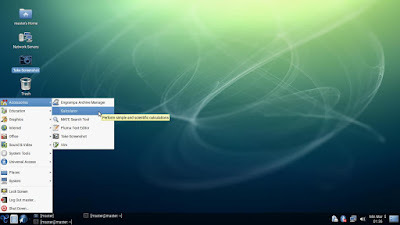 Trisquel is a user-friendly desktop GNU/Linux distro derived from Ubuntu as 100% free software. Trisquel is certified officially by FSF along with gNewSense and Parabola. 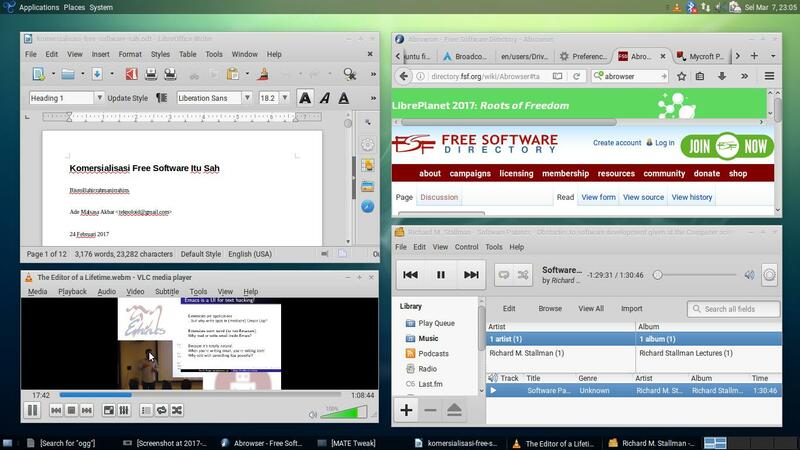 This 8th version comes with MATE as its user interface, with complete audio/video support in VLC, and a full suite of LibreOffice. Despite being alpha, it has 50000+ packages already in its repository worth to wait for the final. I hope this article can encourage anyone to use 100% free distro and spread it. Enjoy! 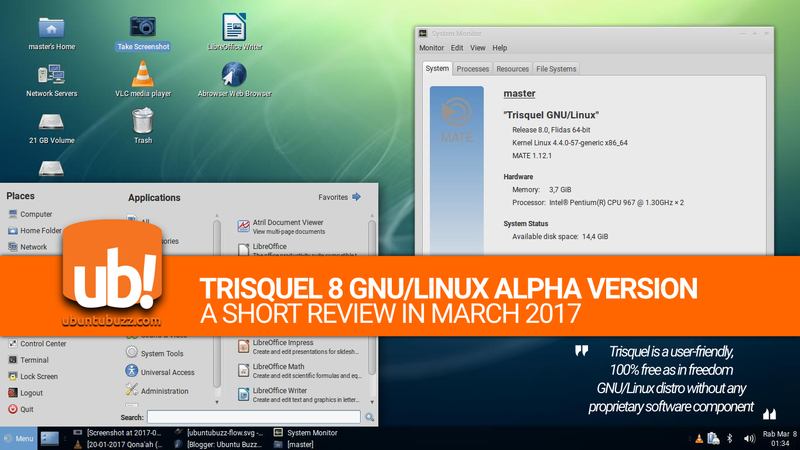 Trisquel GNU/Linux is a 100% free software GNU/Linux distro derived from Ubuntu and certified by FSF. Trisquel does not use Linux® Kernel from kernel.org, but Linux-libre Kernel from FSFLA that is completely free from nonfree components. These mean Trisquel contains no proprietary drivers, no proprietary firmware, in both the OS and the repo. Thus in a simplest sense, using Trisquel is liberating your computing from any software and any developer that would trample your freedom. The MATE version is pretty old because the stable version for now is 1.16. At this time the latest MATE packages available in Trisquel 8 repo are at 1.12. And for the kernel, the latest Linux-libre available is 4.8.0. We need to wait until the Trisquel 8 final released. For my Aspire One 756, Trisquel 8 Alpha does good automatic hardware detection. The only device not detected is my WLAN, because of the BCM4313 requires proprietary firmware. However, I still can connect to the internet through LAN. Overall, it's a very good news I can do all my daily tasks such as browsing and audio/video playing with a 100% free operating system without proprietary software. Note: for your hardware, Trisquel may behaves differently. 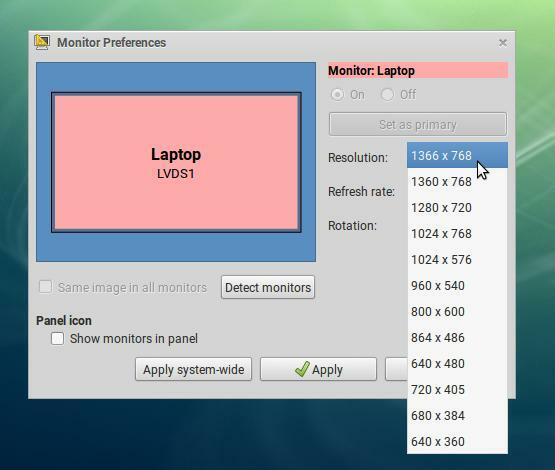 It detects the maximum resolution of my monitor (1366x768) and the rest. It's good. My chipset is Broadcom BCM4313 and Trisquel does not support it. The firmware of this WLAN device is not included nor supported by Trisquel. From my search, I know it's because BCM4313 depends on nonfree firmware although it has some free software drivers (notice that driver and firmware are different things). When I look for any "bcmwl-kernel-source" or "b43" or "firmware-b43-installer" or "brcmsmac" package in the Trisquel 8 repo, from apt-cache or packages.trisquel.info, there is no such package available. This proves that Trisquel indeed has true commitment to reject all proprietary software both in the OS and in the repo. For me, this is a very good thing. Note: the best explanation about Trisquel on BCM4313 is on Trisquel Forum, and more complete technical explanations about all possible drivers are available on Ubuntu Wiki, Linux Wireless Wiki, and Arch Wiki; so you can avoid the nonfree packages. My chipset is Broadcom BCM57785 and Trisquel supports it. I can use USB tethering from my cell phone to connect to the internet without installing any package. It's very good although I can't use my WLAN, I still can use my LAN. I can play my audio and video files well without installing any package. At idle, Trisquel 8 consumes ~520MB or RAM. What processes consume most memory you can see here starting from the highest Caja, Xorg, and mate-panel. It's MATE Desktop 1.12.1. The appearance is modified a bit by Trisquel developer so the bottom panel is a lot more thicker with a dual-row taskbar. You can not use Super Key to open the desktop menu by default (but installing mate-menu package solved this). For my daily use, Trisquel 8 Alpha did not include Inkscape, Shutter, and Shotwell. And this is my personal curiosity for Trisquel (and gNewSense too): why doesn't it include Emacs? However, I still can install all of them from the repo. Here is a picture of my LibreOffice showing document, Abrowser browsing the web, Rhythmbox playing audio, and VLC playing video. By this, Trisquel is ready for end-user's daily desktop use. Trisquel can play MP3, MP4, 3GP files by default. And of course Trisquel can also play OGG and WEBM free format files by default. It's all thanks to VLC, GStreamer Plugins Good, and FFMPEG Libav inclusion. 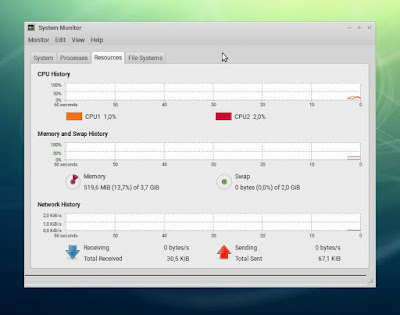 The benefit of using MATE is getting a fast desktop Search Tool. 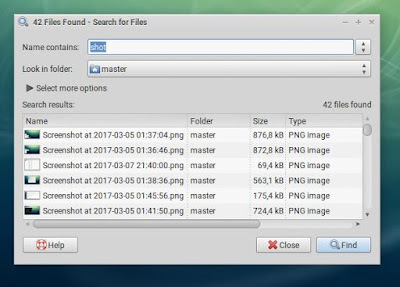 You can do search for your files quickly. Also, it can search through the content of files. For example, If you are a programmer (or writer), this tool helps you to find which file containing certain code or word from many files. It's all because Search Tool makes use of GNU commands find, grep, and locate.